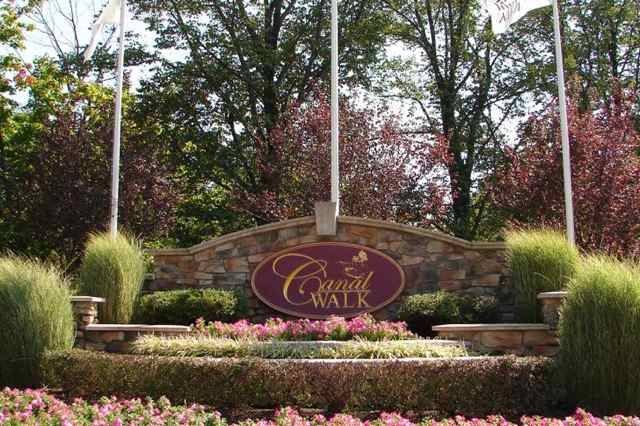 Canal Walk offers a wide variety of home styles perfect for retirement in a premiere New Jersey location. With a gorgeous gated entry, premiere location and exciting amenities, Canal Walk in Somerset is Central New Jersey active adult living at its finest. An on-site activities director, plus the lure of New York City, Philly and Atlantic City nearby, ensures Canal Walk residents always have something to do. Ground was broken in 2002 to lay the foundation for this 55+ community in Central New Jersey. With 1,200 residences planned, construction continues today, so both new and resale homes built by Premier Homes and Garden Homes are available. Buyers can choose from single-family or attached style homes and condos in about a dozen different floor plans. Options range from about 1,500 square feet with two bedrooms and two baths to more than 2,500 square feet with three or four bedrooms and up to three-and-a-half baths. Homes have either one- or two-car garages, making it easy to come and go, even during New Jersey winters. Instead of mixing and matching, Canal Walk has carved out distinct neighborhoods for each home type. The condos are set apart in beautiful three-story buildings with elevators, indoor parking and private balconies. The Enclave features duplex townhomes with three bedrooms and an optional study. The Reserve is designed with single-family homes, available with optional features like gas fireplaces, basements and lofts. Residents can stay put and enjoy their spacious homes, but active adults will no doubt regularly visit Canal Walk's 32,000 square-foot clubhouse. Here, a state-of-the-art fitness center provides cardio and strength training equipment, while the sauna, steam room and a massage and wellness center beckon relaxation after a challenging workout. The clubhouse also features an indoor pool for year-round lap-swimming or water aerobics, so New Jersey winters can't stop you from staying in shape. Extra clubhouse features include billiards, library, card room, computer area and arts-and-crafts studio. Residents also enjoy plenty of social gatherings, special events and a wide variety of hobby clubs and interest groups. Outside, an expansive pool with beautiful red-paver deck lets residents enjoy New Jersey's late springs and beautiful summers. Tennis courts, bocce ball courts, and plenty of walking and biking trails complete the collection of amenities at Canal Walk. Of course, part of the lure of New Jersey is its proximity to the big cities. Residents can zip into New York City, Philadelphia, Atlantic City and even over to the Jersey Shore for day trips and easy weekend getaways. The Appalachian Trail is close by for those with a penchant for hiking and nature. Several ski resorts dot the region too, for adventurous winter athleticism. Somerset itself has plenty of dining and shopping to choose from, as well as local theater, recreation centers, and public and private golf courses for duffers' delight. If you are not fond of driving or owning a car, Somerset County has CATS-Community Access Transit Service that zips residents around to the library, medical center, shopping mall and more for a small fee. From the leisurely activities on site to the ability to partake in big-city culture, the gated, age-restricted Canal Walk community is the perfect getaway, plus the perfect place to call home.